You know quite often on the health food scene one food just kind of spurts up out of nowhere and it seems to be the talk of the town. This is one food that really has gained a lot of notoriety in the past two years and previous to that I’m sure most people just hadn’t really even though twice about them. The ironic part about that statement are these little fruits known as pomegranates are actually considered to be one of the oldest fruits known to man. These native bright red foods come from Persia and were introduced to China in 100 B.C. They date so far back that Romans actually nicknamed these fruits Punic Apples because of their similar shape. This fruit is also nicknamed the “jewel of winter” because it is in season in the United States from September to December. 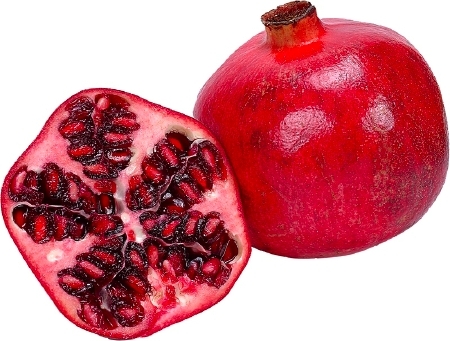 A person trying pomegranate for the first time may be a bit intimidated by the fruit, not knowing how to eat it correctly but in order to get at the good stuff, you should make vertical incisions in the rind and pry the fruit open. This is because the fruit has an outer hard shell type exterior and making incisions will expose the seeds, which you can then pluck from the white membrane and eat whole. A great way I utilize this is by then putting the seeds into a blender and pureeing them. Personally, when pomegranates are in season I like to mix them up with berries like blackberries, huckleberries, cranberries, blueberries, and/or strawberries which usually come in frozen bags. I put all those in a blender with some water, coconut milk, and my best choice for the number one whey protein powder that I’ve found anywhere. This makes for a delicious and super healthy snack and something I dare say almost tastes like a dessert. Go out and try some for yourself and if it’s not in season just use some natural pomegranate juice and throw that in the blender as well. Hope you enjoy!